In the business world requests for proposals, or RFPs, are incredibly common. This is an exercise during which multiple companies or freelancers bid for a project by putting together a proposal outlining what the project deliverables will entail, the time frame the project will take, the cost of the project, and more. In theory this seems like a reasonable and even a responsible thing to do - if you are running a company and you need to bring in outside work, wouldn’t it make sense to get a wide variety of proposals from different companies in order to ensure you pick the right partner? Unfortunately there’s actually another side to this practice - the side that costs businesses time, money, and human power. RFPs are shaping up to be one area that can be easily cut, saving companies a great deal of time and money. Dumping RFPs isn’t going to mean getting lesser quality work; in fact, it may end up getting you better quality work. Rather than limiting your field of potential candidates to those who can afford to lay out $5000 on a bid to get the job without actually getting the job, you open the field up to even more potentially qualified companies and freelancers. In the digital age there is no reason to demand proof of competency when all of that information is available online in terms of portfolios, recommendations, ratings, and more. Smaller companies and startups may not be able to compete with companies that can spend lots of money on an RFP, but they can contribute to your company’s project in a meaningful and impactful way. When looking for a contractor with whom to do business, word of mouth recommendations are king. Look for other similar projects that contractor has done and ask for recommendations from past clients. This is far more valuable than a months-long, costly RFP process among a field of candidates whose only qualifications may be deep pockets. Proof of value software is more than a reasonable replacement for the RFP. You’ve surely heard this mantra from Facebook - it’s meant to highlight the importance of moving fast and breaking things when it comes to innovation and competitiveness. At the end of the day it is far more important to move freely and try new things than it is to waste time and resources making sure every detail of a project is in line before ever making the first move. More nimble companies know this, and that is how they keep in business. The name of the game is innovation, and RFPs rarely yield an innovative result. In fact, RFPs typically specify that in order to bid a company must be in business for a certain amount of time, which by definition cuts out the more innovative startups. Incumbent bidders are often at a distinct advantage, which can lead to a lesser quality product in the end. With today’s technology, there’s just no reason to keep doing things the old way. PoV, or proof-of-value, software can eliminate the need for RFPs at a significantly lower cost. 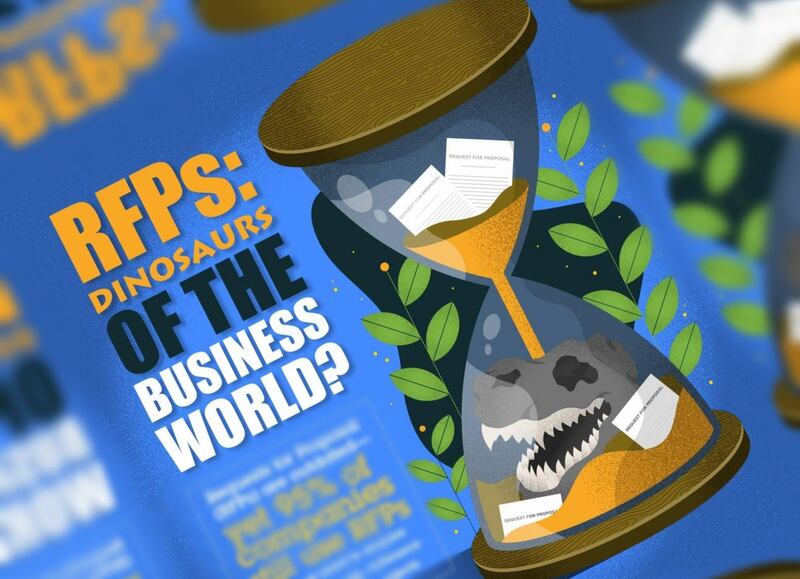 Learn more about why RFPs are the dinosaurs of the business world!